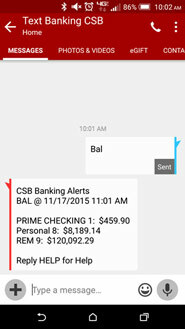 Send text commands (such as BAL) from your SMS-enabled phone to 96924 to inquire about basic account balance and transaction history information. Receive text message responses directly to your phone. To use Text Banking you must be enrolled in Online Banking. Select Options in the upper right. Select Manage Devices in your Mobile Banking Profile. Select the Text Banking option..
* Text messaging is needed to use Text Banking and your mobile communications carrier may charge you for text messages. Please check with your service provider for specific fees and charges.